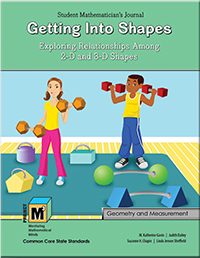 In Getting Into Shapes, students explore 2- and 3-dimensional shapes with a focus on their properties, relationships among them and spatial visualization. The reasoning skills that they build upon in this unit help them to develop an understanding of more complex geometric concepts. They learn new, more specialized vocabulary and learn how to describe properties of shapes with this terminology allowing for greater clarity and precision in their explanations. They move from describing properties to comparing and contrasting properties of 2- and 3-dimensional shapes by classifying them into different groups based on their properties. The focus in this unit is on moving students from their initial level of geometric thinking to the higher level of informal deduction. At this level students can put properties in order and use them to formulate definitions. They are able to see the relationships among shapes and group them into classifications. For example, they would recognize that a square is also a rectangle and both of these shapes can be classified as parallelograms. Students will examine shapes, describe them using their definitions and properties and then find relationships among shapes based on these properties. They will classify and reclassify shapes according to different properties. These kinds of experiences help students develop the more sophisticated reasoning skills used in informal deduction. In addition to studying physical models, students develop and use mental images. In Chapter 2, students learn how to plot points as ordered pairs in all four quadrants and mentally transform a shape by changing its position or orientation. They use the coordinate grid to connect location to transformations. These activities are aimed at developing students’ sense of spatial visualization. This, in turn, will help students make better sense of the world around them.